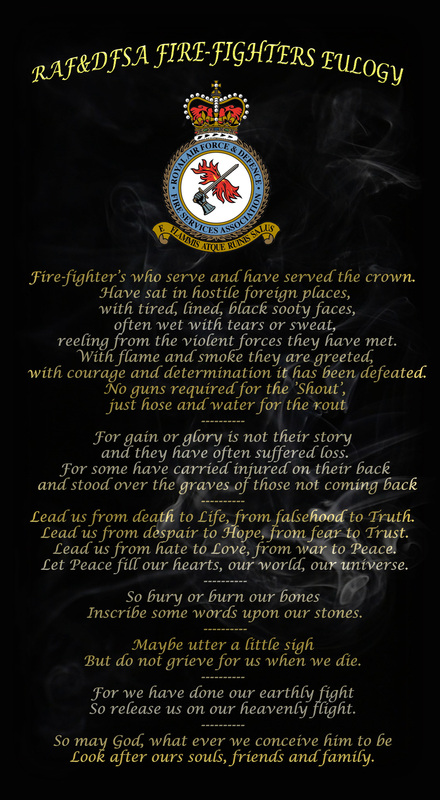 The RAF & Defence Fire Service has a book of remembrance where the names of our fallen comrades are recorded. The poem below was produced by Steve Harrison and is a combination of his own work, some lines from Mick Goupillot and a prayer from Satish Kumar, who was a Jain monk. 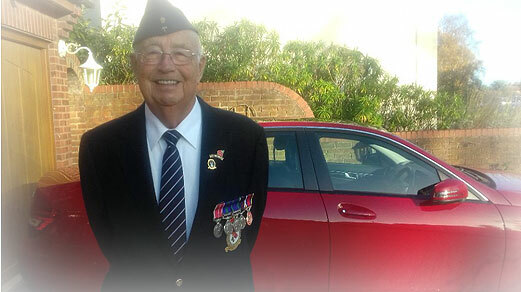 It is with deep regret that I have to inform you of the passing of one your Members, my Uncle Ronald Gill, who passed away on the 5th April 2019. Ron was diagnosed with cancer 3 months ago. The members of the Association would like to pass on our condolences to Ronald's Family. It is with deep regret that I have to inform you of the sudden death of Darren Land, formally of the RAF Fire and Rescue Service, his funeral was in Spain last Thursday. Darren served at both RAF Wyton and RAF Waddington before leaving the service in 1997. His fiancé's name is Ekaterina Zabrodina, and Ekaterina would be most grateful to hear from and of Darren's ex RAF mates who have photos or fond memories of Darren to share. Please contact her by Facebook if you can help with that. Its my sad duty to inform members of the sudden passing of my dear friend John Savage, who left us on Monday the 5th of February. 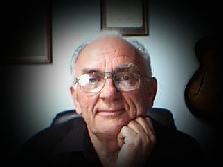 John joined as one of the early members of the association, and was area co-coordinator for Norfolk. Upon leaving the service John joined the Metropolitan Police Force where he had a long and distinguished career, culminating in a much deserved MBE for his services to underprivileged children in East London. He is survived by his wife Jeanie and son Alex. It is with overwhelming sadness that I have to inform the Association that after a year of declining health, Dennis died on 18th January 2019. Dennis was so much loved by everyone who knew him. He was a true gentleman: kind, compassionate, trustworthy, with a good sense of humour and always a good word for everyone. We remember Dennis as a man who was always smiling and a natural peacemaker; a good family man. .. before being Demobbed in 1980. After completing a management course Dennis and his late wife Joan ran a NAAFI complex in Wildenrath until 1992. In 1995 he was one of the founder members of the RAF&DFSA and has enormously enjoyed every reunion meeting friends, old and new. ...which is opposite the Crematorium and adjacent to The Premier Inn [if required], Crown Green Roundabout, Weeley CO16 9AD. We would like medals to be worn if possible, and if any ladies would like to wear some colour, eg such as a scarf in red, yellow or bright blue - Dennis loved bright joyful colours. Dennis leaves a heartbroken wife Pauline, son David and his partner Amy, and Granddaughter Natalia and sister Dorothea, as well as close extended family members including his Canada family. My father, Derek Edwin George Jew, former RAF fire crew in Luqa, Malta, sadly passed away 23/12/2018. Ex RAF Fireman Jason Francis was tragically killed in a road accident outside his home in Scarborough, near Perth, Western Australia, on 22 December 2018. Jason was just 29 years old and was living and working in Australia with his Girlfriend Alice Robinson who was also found dead the next day. This was picked up from the RAF Bruggen Facebook Page, nothing further is known at this time. It is with deep regret that I have to inform you of the passing of one your Members, Ian Crabtree, my father, who died suddenly on 15 December after a short illness. Ian took an awful lot of pleasure from his membership of the association, the reunions, the comradeship, and particularly enjoyed the visit to Steve’s Museum. Following that he was keen to see it in it’s new location - but sadly that was not to be. Only 4 weeks ago we took him and Mum to visit the National Arboretum, and he was keen to see where the forthcoming association memorial would be sited. Thank you all at the association for all that you do in supporting each other, and providing the much needed comradeship that many of us ex servicemen appreciate. The family would welcome any Association members who wish to attend. 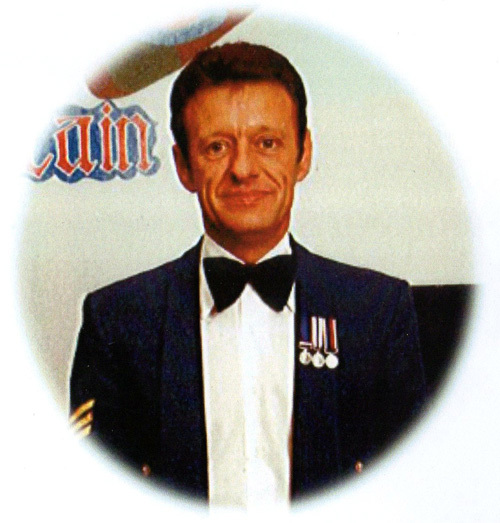 It is with great sadness to have to inform you that ex RAF Firefighter Al Terry had passed away yesterday. No further details at this time but I will be seeing his wife Gill later this afternoon. The service will take place at Grantham Crematorium on Friday 30th November at 12.30pm. Family flowers only. Gill has asked if everyone could please wear their medals!! It is with great sadness I have to inform you that ex firefighter Dave Dunster passed away on 6th November after a brave fight against cancer. If there is anybody reading this who served with Dave could you please get in touch as we would love to know a bit about his time in service. Any stories to share with his wife would be most welcome as we have no photos or anything going back to his time in the RAF . 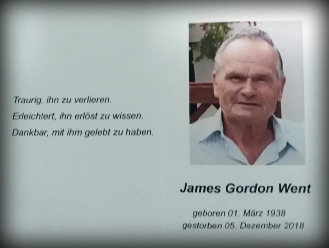 I am so sorry to have to inform you that my father Jim passed away peacefully last night at 21.00 hrs. He was in no pain and his passing was dignified and peaceful. He remained an uncomplaining gentleman to the end. If you would be so kind as to inform other members as appropriate I would be most grateful. Thank you (Brian Jones) for taking the time to write to Dad and I.
on Wednesday 28th November 2018 at 2 o'clock. 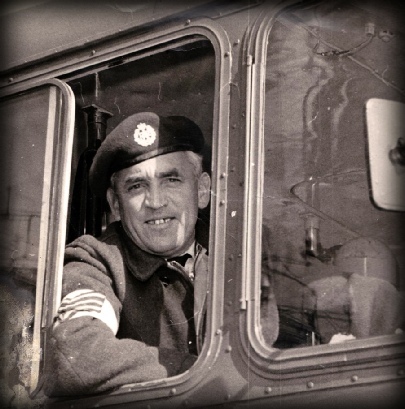 It is with deep regret that I announce the passing of former RAF Fireman Dave 'Ollie' Oliver. It's with a very heavy heart that I have to report that my friend Paul Morris passed away last night. Paul's funeral service will take place on Friday 13th July at 11am in Westonzoyland Church. There is to be a family only service at the crimetorium, followed by a wake at the Westonzoyland Community Centre. 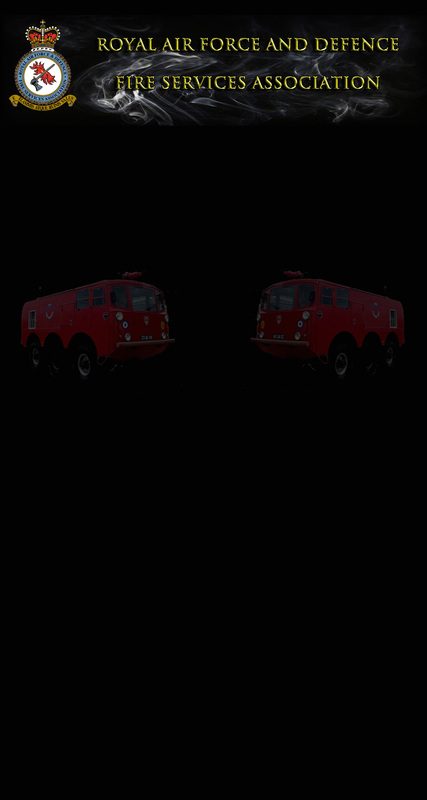 The family have asked that any serving RAF DFS Firefighters wear uniform. Any RAFDFS Association members Blazer, medals and beret. For a further information please PM me or email at backdraft3722000@yahoo.com. I have just learned from his wife, Anne, the sad news that Derek passed away recently at the age of 75. 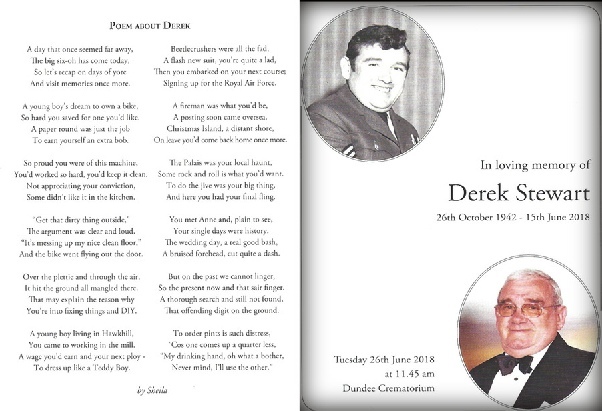 Despite being short in stature, Derek was undoubtedly a larger than life character fondly remembered by all who served with him. During his time he did two tours at Kinloss as well as Gan , Bruggen among others. More information will be posted when it becomes available. "I knew Derek very well; we were on crew together at RAF Bruggen for two years in the early 1970's, then at RAF Kinloss for 6 year from 1977 to '83. He was a great character , there will only ever be one Derek Stewart. As a Corporal Fireman he was a brilliant leader, who could be relied on on all occasions to command the men in his unique Dundonian style. On a night shift we would see a different Derek materialise to look after the crew, taking over as duty cook and preparing meals for the whole shift. Potato fritters were Derek 's specialty, and the crew would all be licking their lips waiting for the fritters to come out of the chip pan. No doubt now Derek will be making the fritters for the boys on the crash line up above. Sadly I have just learned the news that Dave Gale, ex MOD Firefighter based at Lyneham, has passed away following a long battle with cancer. Its with deepest regret that I have to inform you all that Gary o Connor passed away last night. He had a fall at home. They think he might have had a stroke while going up stairs. West Road Crematorium, Denton, Newcastle on Monday 14th May at 11.15am. 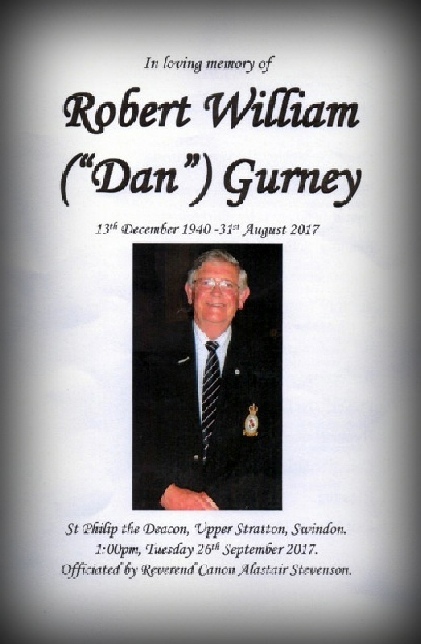 Sorry to have to inform the Association of the death of Ex WO Dave McGreavy in Doncaster this morning at the age of 76.He had lived in Bawtry since his retirement from the RAF in 97. His tours of duty included Gibraltar, Brize and Gutersloh (Harriers); and ended with Trade Standards. The funeral arrangements have now been made. The funeral will take place on Friday 11th May at 2pm, at Bawtry Methodist Church, followed by burial in Bawtry Cemetary. Everyone is then asked to join us at the Crown Hotel in Bawtry. Family flowers only, but donations to cancer research, will be taken on the day or can be made with W.E.Pinder & Son, Bawtry, 01302710285, who will also help with any information needed. You can also reply on here or contact me directly on 01302 719510. Once again many thanks for all your kind words and thoughts. Daves passing has left a huge hole in our lives, but many many happy memories. Everyone welcome. GOD BLESS YOU MY FRIEND AND CREW COMMANDER. SEE YOU WHEN MY TURN COMES. Dave Adams was a proper Fireman, a true Gentleman and a born leader of men. As a Cpl I served on Dave's crew at Wildenrath and when I got my third strip I am not ashamed to say I modelled myself on Dave and benefited greatly from all he thought me. Dave's Funeral service will be at St Mary's Catholic Church, Whitstable at 10am on Tuesday 24th April, then on to Barham Crematorium for 12 o'clock. After-service drinks are being arranged. It is with a heavy heart that I bring sad news. Our fellow crew member, colleague and friend, Ian Smedley (Tosh) has passed away. It is with great sadness that I must announce the passing of our fellow fire fighter Graeme Matthew Brown known as “Matt”. Matt left the Service in November 2016 before going to work for G3 systems in Kabul, Afghanistan. His family has requested that I release the following details for Matt’s funeral. Location: East Chapel, Brakespear Crematorium, Ruislip, HA4 7SJ. It is requested that current serving military personnel wear their No 1 uniform with Medals. This will have to be requested through respective Unit chains of command. Any ex serving personnel who are now serving with other uniformed Services are welcome to wear their respective uniforms as a mark of respect for Matt. 'It is over 40 years since Bob was my boss at RAF St Athan, although we did meet a few times at association functions several years ago, so what can I have to say? That however, on reflection is the make of the man! 40 years on and yet to this day I still remember him with deep respect, admiration and gratitude. I know that without his calm guidance and aid I would most certainly not have had the career that I did and I’m sure that could be said by many. The world is most certainly a far poorer place for Bobs passing and I would like to pass my sincerest condolences and deepest sympathies to his family and friends who can be sure that there will be many like myself who will always remember him and feel a pride in having known him or served with him albeit far to briefly. and finally RAF St Mawgan 1989 when he was demobbed in May 1990. Gareth will be lovingly remembered by his wife Annette Roberts and their three cherished daughters Natalie Amie Roberts, Kayleigh Roberts and Ashleigh Jayne Roberts. Gareth was originally from Bushey but had lived in Risca South Wales since hi demob. 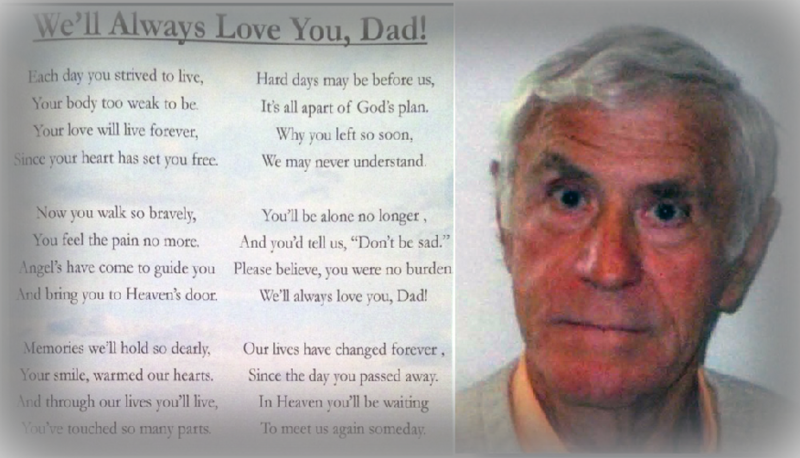 The Funeral Service will be at 14.30 ST Mary's Church RISCA then CROESYCEILIOG Crematorium for 16.00hrs 26 February. I regret to have to inform you of the passing of my father Peter Fleming on 17 November 2017. 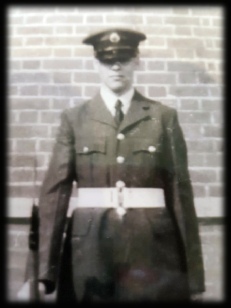 It is with great sadness I must inform you that Sgt Frank Deverill (Retired) passed away peacefully following a short illness on 24th October 2017. For those that wish to show their respects, his funeral will be held at Barham Crematorium, Canterbury Road, Barham, CT4 6QU at 1.20pm on Monday 13th November, followed by light refreshments at Age Concern (Sandwich), 19-21 Cattle Market, Sandwich, CT13 9AP. I regret to have to inform you of the passing of my father Frank Menzies, service number V4004870, who died on the 3rd October 2017 aged 90. Frank was a career fireman who served from the early 1950's through to the 1970s. Whilst on active service in Cyprus he found himself in charge of RAF fire crews tackling a major incident at a Shell Oil fuel storage facility at Larnaca which had been attacked by saboteurs. The fire raged for eleven days during which Frank's courage, determination, and high standards of leadership and professionalism led to him being awarded the British Empire Medal for gallantry. Please read the citation here. Frank's funeral will take place on 20th October at 1620 hrs. at Haltemprice Crematorium. Main Street. Hull. HU10 6NS. I regret to have to inform you of the passing of my father Kenneth Arthur Mallett, service number 4183840, who died on the 27th September 2017. Ken was born on 29th December 1937 and joined in the RAF Fire Service in 1957 after which he was stationed at Christmas Island during the nuclear weapons testing program. He later transferred to Defence Fire Services to be based at RAF Wattisham in Suffolk where he served until it stood down as an RAF Fighter Station in 1992. No funeral arrangements have been made yet, but Dawn would like to hear from anyone who served with Ken. Her number is 07446360142, email dawnjmallett@gmail.com . 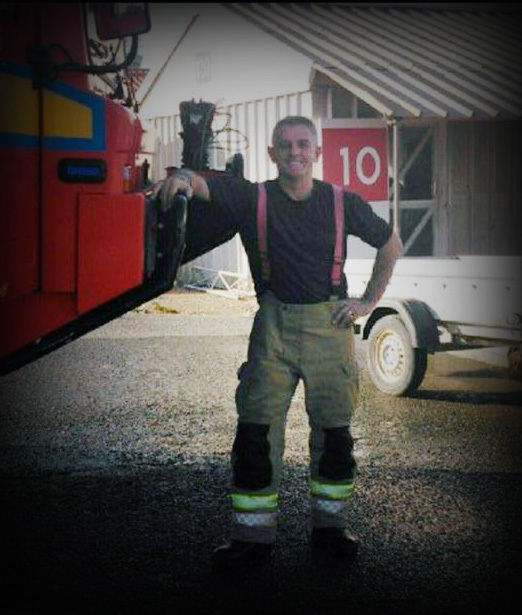 I have been informed of the very sad news that Dan passed away on Thursday the 31st August 2017, He was a popular member of the RAF Fire Service and later transferred to Defence Fire Services to be based at RAF Lyneham. Dan was also a member of the Wootton Basseteers group who attended all repatriations of fallen comrades. The funeral service will be held on Tuesday 26 September at 13:00 at St Phillips Church, Beechcroft Road, Swindon, followed by family only at the crematorium. I regret to have to inform you that I have just heard the sad news that WO retired Mick Moncrief died on Sunday 30th July 2017 after a long illness bravely borne. I first met Mick in 1964 at RAF Northolt and we remained the best of friends ever since. We served in Gan together in the early 70's and saw each other regularly including the Association reunions when Mick and Mary were well enough to attend. Mick and I enjoyed doing a bit of Moonlighting together; driving heavy trucks for Mulberry stainless steel. He leaves behind his wife Mary and three children and grandchildren who will miss him greatly. God Bless You Mick RIP. Mick's daughter Jenny says that Mick died peacefully at Withybush Hospital aged 76 and will be sadly missed by all his family. The funeral service takes place on Tuesday,22nd August at Parc Gwyn Crematorium, Narberth, SA67 8UD, at 11.30am. Afterwards refreshments at Robeston Wathen Village Hall. Robeston Wathen. I have been informed of the very sad news that Brian passed away on Friday the 18th June 2017 at home in Elgin after a short illness. 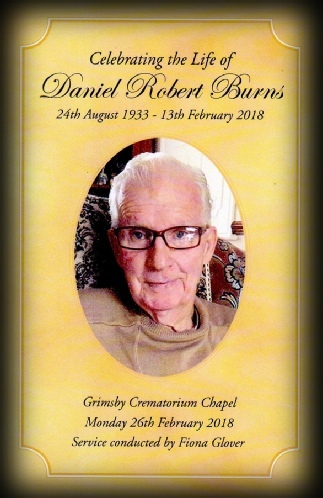 He was a popular member of the RAF Fire Service having served over 22 years before retiring at KInloss where he continued to work on the airfield as a Bird Control Officer. Brian later became a bus driver and rose to the rank of Inspector on Stagecoach Buses based in Elgin. I have been informed of the very sad news that Dave Stevenson passed away on Friday the 30th June 2017, aged 53. He was a popular member of the RAF Fire Service and he served at RAF St Mawgan, Coningsby, Saxa Vord, AFCENT and Ascension Island to name a few. Dave's funeral service will take place at Lincoln Crematorium at 13:10 on Thursday 10 August. Family flowers only and no medals thank you. There will be a chance to reflect over a beer at the Bull pub in Bracebridge, Lincoln. I am sorry to inform you of the passing of John Beers who died peacefully in hospital on Tuesday June 20th, aged 71 years. 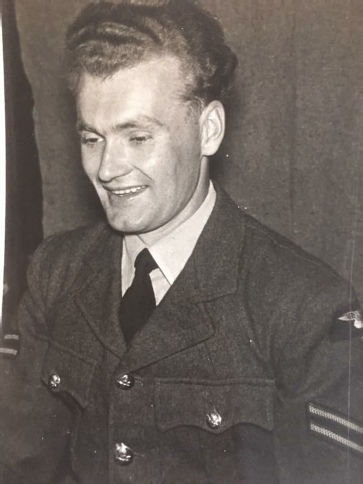 John was a well liked and highly respected member of the RAF Fire Service who served at Malta, Saxa Vord, Kinloss, Wildenrath and Gutersloh among others during his long career. His last posting was I/C RAF Newton Fire Section, and after leaving the service he worked for Draeger at Blythe, in his native North East England. Friends please meet for a service at Whitley Bay Crematorium on Wednesday June 28th at 1.30pm. All welcome to The Hastings, Seaton Delaval afterwards. Family flowers only please, donations in lieu may be sent for Macmillan Cancer Support, C/o Melrose Funeral Services, 157-159 Astley Road, Seaton Delaval, NE25 0DL. I am sorry to inform you of the passing of John Wright who died suddenly on Monday 13 February. John will be sadly missed but remembered always by his many friends and colleagues from happier times when serving at RAF Aldergrove in the late 1950’s and early 1960’s. Our thoughts and prayers are with his wife Marlene, family and friends.